DRIVE ON: A capable cast doesn't rescue the strange pacing of 'Ring of Fire,' another country-music bio. 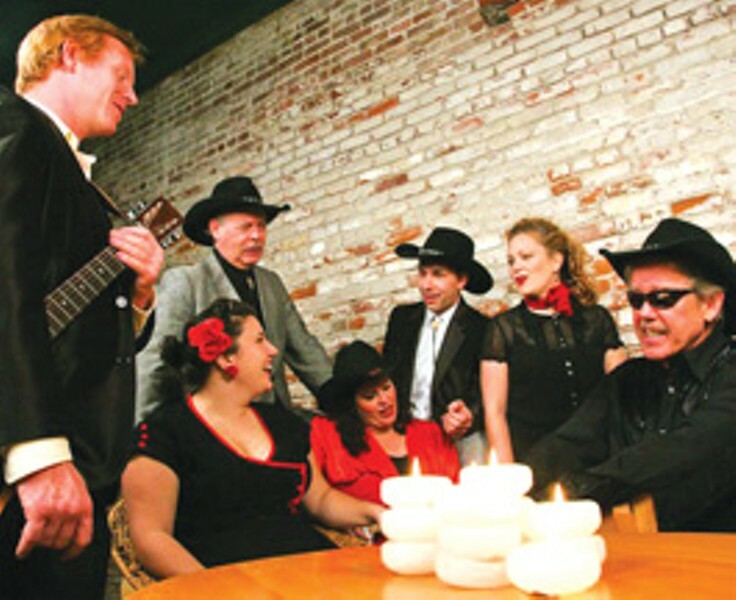 Since the title of Sixth Street Playhouse's new musical production is Ring of Fire: The Music of Johnny Cash—with deliberate emphasis on the word "music"—audience members might be expecting a little more Johnny Cash than what shows up in this slapdash (though occasionally well-performed) jukebox revue. In the show, written by Richard Maltby Jr. and William Meade, and directed by Michael Fontaine, seven performers take turns singing 32 of the Man in Black's songs, with snippets of uneven narration (jumping oddly from first person to third with no rhyme or reason) that are passed from performer to performer like lyrics in a gospel tune. Short scenes from Cash's early life are reenacted here and there, with different actors playing Cash each time, creating a bit of initial confusion while serving to remind us that this show, after all, is not really about Johnny Cash; it's about Johnny Cash's songs. Fortunately, his songs are great. One tends to forget what a sharp and twisted sense of humor Cash had, on prominent display in songs like "Flushed from the Bathroom of Your Heart," "Dirty Old Egg-Suckin' Dog," the darkly comic murder ballad "Delia's Gone" and of course "A Boy Named Sue." "I Walk the Line," "I've Been Everywhere," "Ring of Fire," "Jackson." The songs are arranged in thematically similar clusters, performed as blocks of music introduced with smatterings of biographical data, some of it unintentionally hilarious. The second-act cluster of prison songs ("Cocaine Blues," "Orleans Parish Prison" and "Folsom Prison Blues") is set up with a short speech allowing that, while Cash never actually served time in prison, he did go to jail a few times, and that was why he felt so strongly about telling the stories of murderers and thieves. The strangest moment in the show comes right after a stirring full-ensemble rendition of "Why Me Lord? "—a true highlight—when the audience is told to sit tight for a moment and spend three minutes watching slides of Johnny Cash posters while the band, a tight, pleasing quartet led by music director Eddie Guthman, continues playing. Once the cast returns, dressed in concert finery, we're told that the rest of the show is more of a concert than what we've already seen (!? ), and each of the performers proceeds to tell us how much they like Johnny Cash's music before singing a few more songs. The cast is capable, though uneven. The women (Courtney Arnold, Shari Hopkinson and Heidi Lechner) handily out-belt the men (Jacques Archer, James Bryant, John Faulkner and Eric Chazankin), though Chazankin has one of the show's most entertainingly Cash-like moments, with his resonant, forceful performance of "Folsom Prison Blues." In the end, "Ring of Fire" could use a bit more fire—and perhaps a bit more Cash. 'Ring of Fire: The Music of Johnny Cash' runs Thursday&–Sunday through Feb. 13 at the Sixth Street Playhouse. Thursday&–Saturday at 8pm; Saturday and Sunday matinees at 2pm. 52 W. Sixth St., Santa Rosa. $15&–$39. 707.523.4185.